Communication is key to any mission's success, so carry radios close with the Radio Pouch from Voodoo Tactical. Designed for versatile carry, the pouch utilizes a universal strap backing for convenient securement to backpack straps, vests, tactical outerwear and other web platforms. An elastic retention strap secures radios in place for a reliable hold throughout all levels of physical activity. Hook-n-loop security cords offer additional retention capabilities and keep the radio secured to the user if dropped. A full, hook-n-loop flap closure protects pouch contents, while an antenna opening allows for a secure fit without compromising signal strength. The addition of metal grommets offer liquid drainage to prevent damage caused by moisture build up. The Pouch works great for bigger radios. 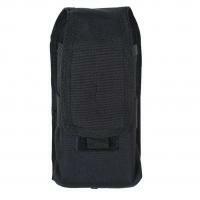 It is a MOLLE compatible pouch.